Acknowledged author Michael L. Cain wrote Campbell Biology (10th Edition) comprising 1488 pages back in 2013. Textbook and etextbook are published under ISBN 0321775651 and 9780321775658. 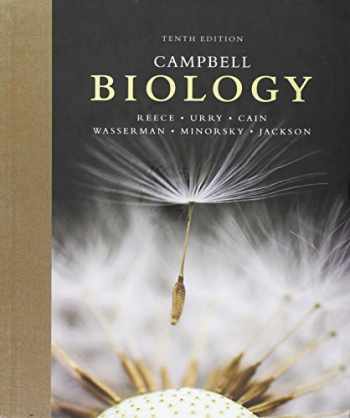 Since then Campbell Biology (10th Edition) textbook was available to sell back to BooksRun online for the top buyback price of $0.91 or rent at the marketplace. The Tenth Edition of the best-selling text Campbell BIOLOGY helps launch you to success in biology through its clear and engaging narrative, superior pedagogy, and innovative use of art and photos to promote student learning. The Tenth Edition helps you develop a deeper understanding of biology by making connections visually across chapters and building the scientific skills needed for success in upper-level courses. New Make Connections Figures pull together content from different chapters visually, helping you see “big picture” relationships. New Scientific Skills Exercises in every chapter use real data to build key skills needed for biology, including data analysis, graphing, experimental design, and math skills. New examples show you how our ability to sequence DNA and proteins rapidly and inexpensively is transforming every subfield of biology.